Kate Thornton aims to Exceed Your Expectations. She gives the female touch and tenderness to your home improvement needs. She provides warm, friendly, helpful, enthusiastic, empathetic, professional home improvement service, which comes from the heart. 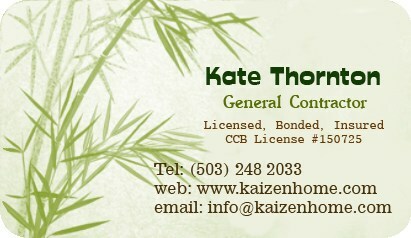 Kate Thornton is bonded, licensed and insured general contractor. She handles your small to medium-sized home improvement jobs around Portland Oregon area. Copyright © 2007 Kaizen Home All Rights Reserved.